We have customers who want their users to create or update records, but they want to make sure that some fields are filled in or populated with certain criteria. For example, let’s say you want to give users an action for closing a task without requiring them to go to a full edit page. But you also want to make sure that the task has a due date before it can be closed. In the object management settings for activities, go to Task Buttons, Links, and Actions. 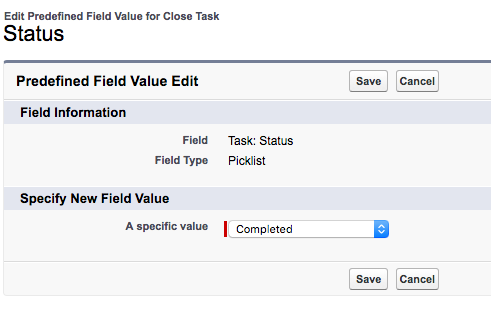 Select the fields that you want to appear on the “Close Task” quick action. You can easily make a field “Required” or “Read-Only” through its field properties. After you’ve set the fields on the action layout, you can add predefined field values for any of the fields on the task record. In this example, I’ve marked the Due Date field as required. I also added a predefined value for the Status field to be changed to Completed. Now that the action definition is finished, add this action to the Task page layout for users. 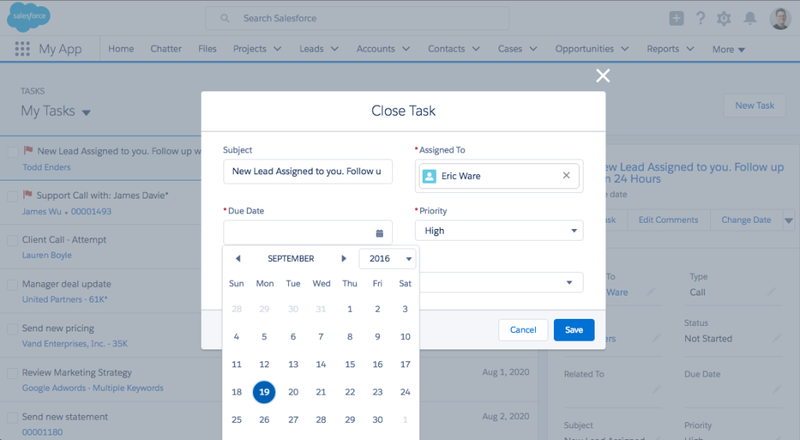 Once that’s done, users of Lightning Experience and Salesforce1 can see it on the task record page and use it. 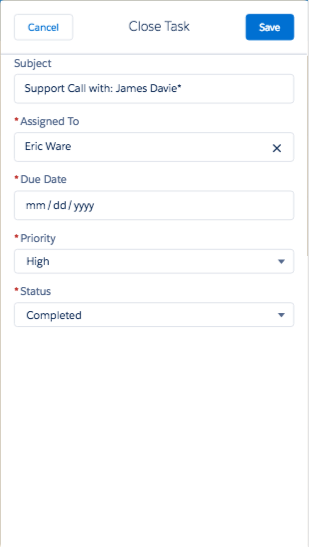 Here’s an example of a Close Task action on the Tasks page. The same action is also available in Salesforce1. For example, your inside sales teams’ typical quarterly quota is one fourth of their customers’ revenues from last year, upped by 10%. But that simple formula doesn’t always hold true, so you want to prefill the opportunity amount with that value, but let the user modify it. The benefit of the action is that users can do this efficiently without having to navigate to the full opportunity record page. In the object management settings for accounts, go to Buttons, Links, and Actions. You would then add this action to the Account page layout, and when users invoke it, they see a value pre-populated in the field that they can accept or override. But don’t worry about remembering the formula formats, quick actions are declarative and use our formula builder. 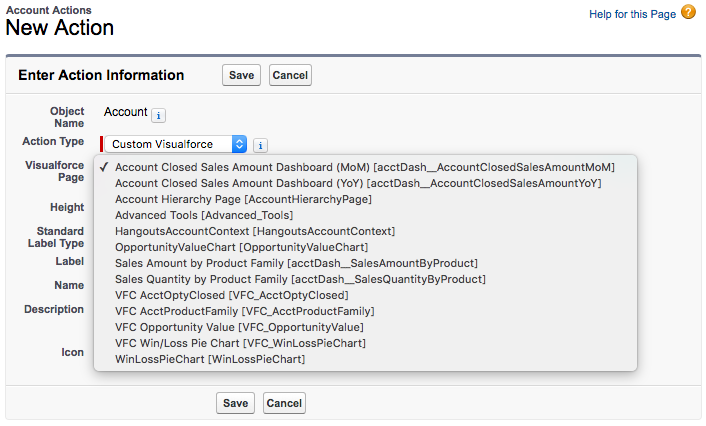 Salesforce customers create Visualforce pages to enhance their business processes. Users can navigate to these Visualforce pages in a variety of ways, such as with custom buttons, action overrides, and tabs. 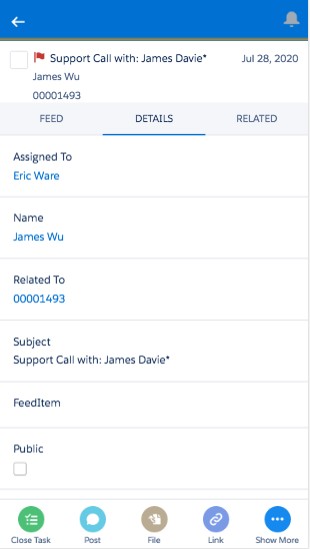 One benefit of Visualforce pages is that by using the standard controller, you can create customized record pages and add pre-validation, pre-populated fields, formulas, and much more. Here’s a list of different URL buttons and their redirect behavior in Lightning Experience. Many of you are probably familiar with Apex triggers; they’ve been supported on our platform for years. Apex triggers can be set up to execute before or after a user clicks Save on a record. When your use cases call for pre-save validation, calculation, and population of fields, you should also consider triggers. 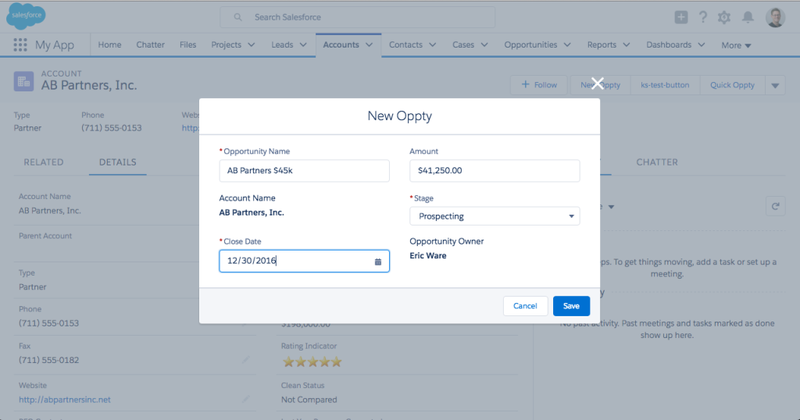 They’re especially useful for 3rd-party integration scenarios because the rules are enforced through the Salesforce API across Salesforce Classic, Lightning Experience, and Salesforce1. For more information on Apex triggers, check out the Apex Developer Guide and earn the Apex Triggers badge on Trailhead. 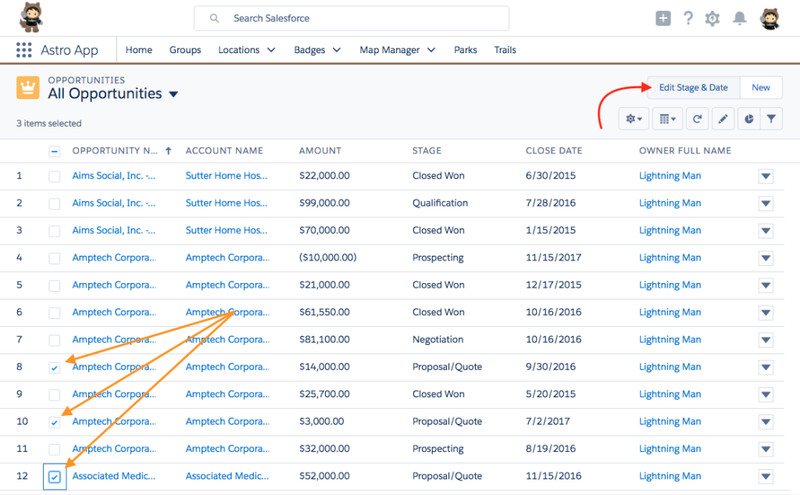 Another great feature in Winter ’17 for Lightning Experience is support for using Visualforce buttons on list views. 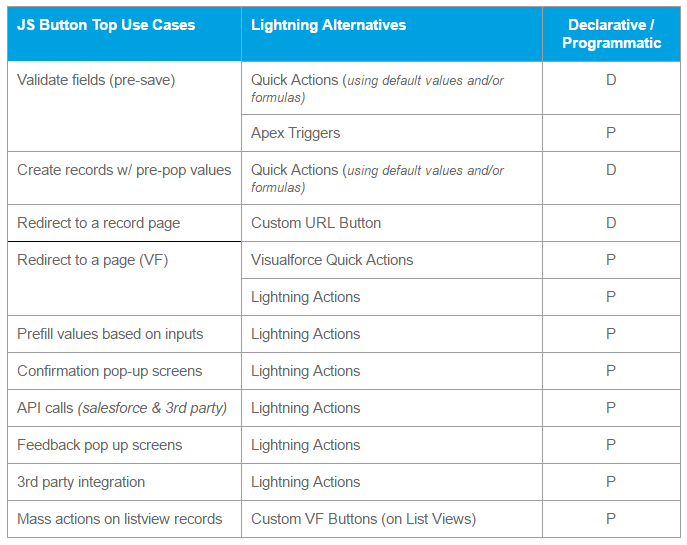 With this feature, you can use existing Visualforce actions in Lightning and work with multiple records in lists. Here’s an example of how. 1. Create your Visualforce page. 2. 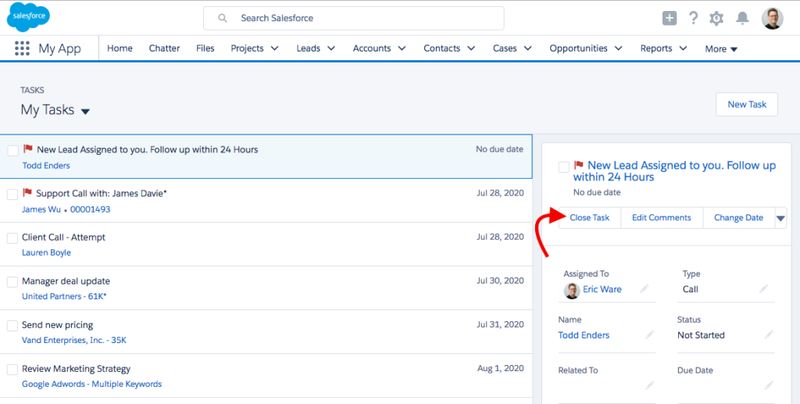 Create a custom button that references your Visualforce page. 3. Add the action to your list view. Mass actions aren’t supported on the most recent records list. They are only available on list views. Want to find out more? Join us at one of these Dreamforce ’16 sessions!